As a British Muslim woman, I’m exposed to very particular and intrusive criticisms when it comes to the way I live my life, often by complete strangers. On one end of the spectrum, I have to deal with the hostility and ignorance offered by a growingly Islamophobic world. On the other, I deal with hostility and ignorance within the Muslim community itself, which is so diverse that we often find ourselves bickering with one another over our differences. My art is a way of combatting these voices that try to invalidate the choices I make when it comes to my religion. Art is a beautiful medium that speaks to people from all walks of life, so I use it in an attempt to unite us all despite our differences. When did you start this style of animation? I didn’t really go through a trial and error sort of process; every artwork I created had some kind of message I wanted to get across, and I’ve been more focused on communicating that message than I have been on developing any particular style. That’s why I feel I don’t have a signature technique, or that my drawings are very original. They’re actually quite simple if you really look at them. I hope to develop more as an artist in the future – it would be pretty cool if someone could look at my work and instantly recognise me as the artist. 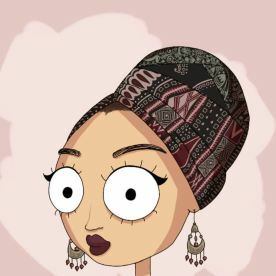 Why is having specific images of/for women in the hijab important? The stigma around women in hijab is glaringly obvious in today’s political climate. Especially in Western discourse, there is a burden of representation when it comes to hijabis. I specifically say hijabis because these women are more recognisably Muslim than anyone else that shares their faith. In my experience, a hijabi is seen purely as a representation of Islam – more an ideological symbol than a human being. It’s important that hijabis are represented in ways more human than political so that they might be normalised, humanised, understood, and appreciated by those who lack greater awareness. Why do you think big name brands are slow to bring options for women of colour and women in the hijab? Speaking in terms of the West, I think we like to talk about how progressive we are, how civil we are, and essentially how much better we are than other developing countries in terms of equality and opportunity. The truth is that we are still trying to break away from the uncivil power dynamics that were such an integral part of Western imperialism and colonialism. It’s almost as though we are stuck in this mentality that somehow a person has more value, more beauty, more intelligence, more everything, if they are of a certain ethnicity or nationality. This sense of racial or cultural superiority is ingrained in Western attitudes both past and present. The growing diversity and social awareness amongst different groups in the West means we are finally moving towards total equality – however, it’s an ongoing process. We are most certainly not a post-race society; in fact, I think we’re merely taking our first steps towards becoming one. We still have a long way to go, hence the gradual inclusion of women of colour and women in hijab when it comes to the public eye. What are the challenges of creating art for Muslim women of colour? 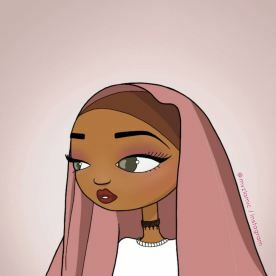 Muslim women of colour span so many cultural identities – it can be difficult to represent all these cultures in a way that does them justice, without making them feel excluded from the Muslim identity. I’m still struggling to find a balance. The greatest challenge, however, comes from the type of attention that my art attracts sometimes. The visual ‘Otherness’ of Muslim women of colour can bring racists, xenophobes and sexists to the surface of Instagram where I share all of my work, along with all of their unwarranted opinions. All I can do is be patient and continue with my small contribution to the betterment of Muslim lives in the West. Who are your main art inspirations? In terms of content, I really look up to a fellow comic artists on Instagram, including @yesimhotinthis, @thepakistanimarthastewart, and @aqsasqa. They all share many of my sentiments towards social issues in terms of my own religion and culture. I adore their work and the messages they spread, and I try to emulate a similar message in my own way. In terms of stylistic inspiration, I suppose I draw on the memory of some of my favourite cartoons, such as Oney Cartoons on YouTube, Adventure Time, Rick and Morty, and many more. I hope to immerse myself more into the art community so that I might be inspired to develop a more distinctive and less generic style. Was it difficult to start this drawing muslim women? It wasn’t difficult to start, because my personal motivations behind what I do made me eager to start drawing and sharing. As far as I knew, there weren’t many artistic representations of Muslim women on social media, which only pushed me to start drawing as soon as I could. What factors do you have to consider when starting an art project? For more serious posts, objectivity is a huge factor. I need to state things as they are without investing too much emotion into what I’m communicating to my audience. This is because a lot of the reminders or thoughts that I share are inspired by political and social issues, both of which can be sensitive matters for any person. My purpose with posts like these is to educate and to bring awareness, and I feel that offending my audience intentionally is not the way to do this. There needs to be sound logic and reasoning in my work, or else I feel it loses its validity. For all my posts in general, I try to consider the relevance of it to Muslim topics or issues. My work is about Muslim representation, after all. It’s important for me to produce something that either resonates with Muslims themselves, or something that non-Muslims can recognise that will build a greater insight towards Muslims. I would ask which oppressor they are referring to. “Islamic” or anti-Islamic? I often find the latter ironic: non-Muslims will attempt to tear Islam down by saying it mistreats women, but at the same time their own people and their own governments will socially and systemically oppress people for being Muslim, or for being people of colour, or for being women, or for being economically disadvantaged, and the list goes on. I don’t mean to contest the fact that some Muslim women face oppression, in the same way that other women face oppression all over the world regardless of their faith. However, to state that Muslim women are oppressed by their own faith more than any other person of faith is a misinformed opinion that contributes nothing to the real issues at hand. Any advice for Muslim women starting up brands? To all my sisters wanting to start their own business or brand: I’d urge you to hold onto your identity no matter what. Never compromise your identity for the sake of pleasing your audience/customers. That being said, you should also never allow someone to use your identity against you to stop you from doing great things. Being a Muslim woman is a strength, not a weakness, and anyone who tells you otherwise is sorely mistaken. The most important thing is to remember why you chose this life of Islam, and hold onto it in spite of the adversity you may face. Success comes from Allah: remember Him in all that you do, so that you may have barakah in your work. I would tell the younger me to have more faith in myself, and more confidence in my abilities. Being afraid to speak out because of the fear of rejection or hatred doesn’t get you anywhere. You need to speak out despite all the opposition you’ll face, and share yourself with the world so that it might know and accept you, because hiding away won’t make the world a better place. Anything huge on the horizon that we can expect from you? Any exciting new pieces? I’m extremely honoured to be working with other young Muslims on a number of projects; I hope to share some of these over the next few weeks on my Instagram page, so keep an eye out for those. In other news, I’ll be sharing something very exciting with my followers on Instagram soon – I’ll have to keep you in suspense until then!